Last year I recommended Crossing the Sea: With Syrians on the Exodus to Europe by Wolfgang Bauer. As there, unfortunately, has been little positive change in the refugee crisis, it is still extremely topical, and I am suggesting two further titles to delve into this subject. The first one is called Stepping Stones: A Refugee Family’s Journey, a children’s book by Margriet Ruurs, a Dutch-Canadian award winning author. The story behind the book is very heartwarming and right up my alley as it is all about cross-cultural understanding and collaboration. Ruurs happened to see some of the intriguing stone sculpture images of Nizar Ali Badr, the illustrator, on the internet, managed to contact him in his hometown in Syria and subsequently to agree on this book as a team project. The images are solely composed of various shaped and colored stones and beautifully illustrate the story of a young Syrian child whose family is swept up in the war. They are forced to flee their home country, leave possessions and friends behind, walk for days on end before making the treacherous sea crossing and ending up in a new country with a different language and customs. Ruurs chose simple but relevant words to go along with the expressive illustrations. This book is not only original for its art work but also for its bilingual text in both English and Arabic. I highly suggest it for children ages 5 and up. 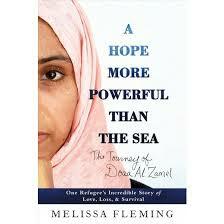 The second recommendation is a title geared toward teens and adults and written by Melissa Fleming, the chief spokesperson for the United Nations High Commissioner for Refugees. 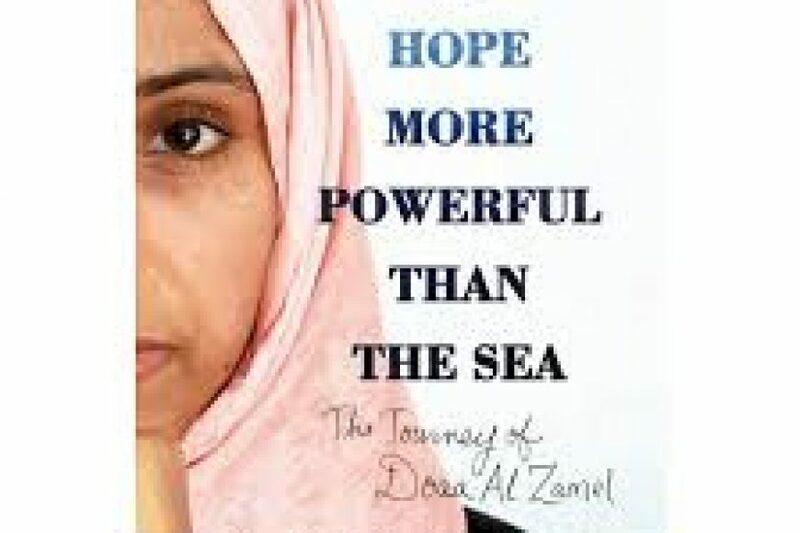 A Hope More Powerful Than The Sea: The Journey of Doaa Al Zamel is a nonfictional account of an ordinary Syrian family, focusing on the perspective of Doaa, the family’s fourth daughter. We learn about her upbringing in a close-knit family in crowded quarters, her love for her parents, older sisters and younger brother as well as her natural curiosity and desire to learn and possibly stray further than her expected path of marriage and motherhood. When she is 15, Syria joins the Arab Spring movement and fights against the oppressive regime of Bashar al- Assad, thus unleashing a complicated civil war. To escape the violence and the daily restrictions on freedom and essentials, Doaa and her family initially set out for Egypt, a country that welcomes refugees until its own government is overthrown. At this point Doaa and her fiancé Bassem decide to risk a Mediterranean crossing with the goal to seek refuge in Sweden and bring the rest of the family on a safer route. The crossing is horrific and deadly for most passengers with Doaa one of the few survivors. This book is a story of an ordinary girl maneuvering through extraordinary times, and the plot driven structure is definitely a page turner in parts. Fleming did extensive research and it shows in her writing, however due to the nature of this being a third person account it is not quite as expressive as I imagine it could be in Doaa’s own words. In any case, I highly recommend this title for its great attempt at portraying refugees as human beings rather than an abstract crisis which might be the first step in moving towards a solution to said crisis.